Add some off-road style and protection for costly and fragile parts, such as your tail lamps, with these tail lamp guards for your JK Wrangler. 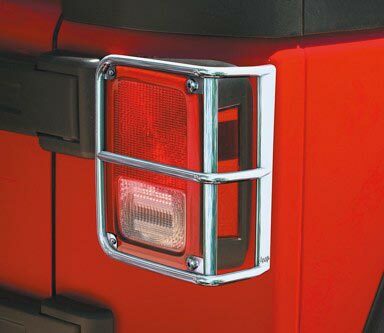 The tail lamp guards are made of die-cast aluminum and are available in your choice of satin black or chrome finish. They feature the Jeep logo and they match the optional fuel door cover and bumpers for an integrated look, so you can choose the combination of accessories you want to create your own unique style. Set of two. Available in Satin Black (Matches fuel door and bumpers) or Chrome. With Jeep logo, Die cast Aluminum. Please select above. Easy to install. Looks nice on my wrangler. ConsOnly came with 5 screws not a problem tho. Perfect addition for a little protection from swinging branches or debris although honestly just looks good. ProsEasy install, just Phillips head screwdriver. Purchase came with extra screws in case you accidentally stripe one which was a nice addition. ConsThere were no rubber grommets (o-rings) which I just bought off Amazon to add a little padding between the metal and plastic light covers. Just search for rubber grommets and get a 1/8" set of 8 or a kit which has 250 pieces for just $5. Jeep logo gives it an OEM look. Easy to install, took just 5 minutes. Contour aligns with the panels of the body. Adds a different rugged look. ProsMakes your jeep stand out from others. Easy and fast instillation! Looks great. Just For Jeeps was easy to order from & delivery was fast! 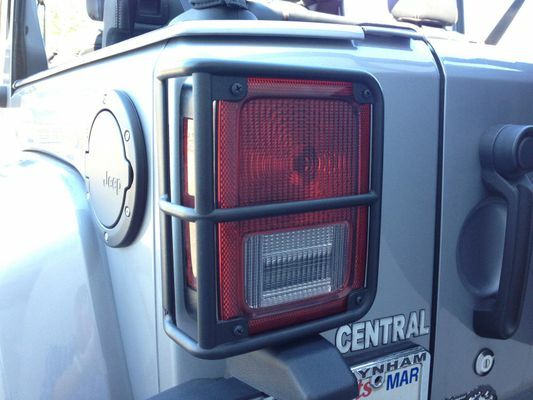 Very easy to install, helps keep the plastic rear lights from getting scratched or damaged, plus gives a nice look to the back of the jeep.